Does a buyer get his or her money’s worth with this 2 CD, 30 song collection? Sony’s Legacy Recordings gets some props for truth in labeling with this collection. They could have simply placed James Taylor’s 20 best-selling singles on one CD and it would have constituted a purchase-worthy collection. 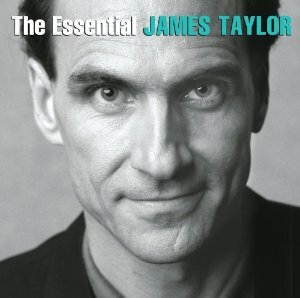 Instead, on The Essential James Taylor the listener/purchaser has those 20 songs plus an additional 10 more on two CDs. For any greatest hits collection there will be some quibbles. I would have left off the overly short “Long Ago and Far Away” (which seemed to be an idea for a song rather than a finished item, on which Taylor was accompanied by Joni Mitchell). Instead, I would have included “Mockingbird,” on which Taylor sang with his then-spouse Carly Simon – assuming the rights were available for licensing from Elektra/Warner. And I would have preferred “Suite for 20G” instead of the live take on “Steamroller.” Nevertheless, all of Taylor’s hits – as documented by their Pop and Adult Contemporary peak chart positions – and several lesser-known songs are found here. “Honey Don’t Leave L.A.,” written by Danny Kortchmar, is one of the fun and unexpected selections in this compilation. Fortunately, “Her Town Too,” co-written and performed by Taylor and the very talented J.D. Souther, is included. There’s an interesting track, “Hard Times Come No More,” recorded with Yo-Yo Ma and a jaunty live version of the classic “Country Road.” “Secret O’ Life” – recorded live, is a nice surprise for those not previously familiar with it. A word about the sound. This compilation was produced by Bill Inglot and mastered by Vic Anesini. Anesini has been involved in mastering several Legacy discs, including Over the Bridge of Time: A Paul Simon Retrospective (1964-2011). Here, the Inglot-Anesini team has delivered a set of discs with a nice, warm mid-range tone that’s generally pleasing to the ear. This collection is not a case where artificial “punch” and jarring loudness are added for dramatic effect. The sound is as soothing as Taylor’s voice. And Taylor’s and Kortchmar’s guitar work is easily heard in the mix. There are a couple of tracks that sound a bit flat, as if one were listening to the songs over a set of television speakers. But all in all, it’s a compilation that sounds consistently fine whether one is listening at home or in the car. It’s a bit of a puzzle as to why Inglot placed the songs in almost, but not quite, chronological order. Perhaps it has to do with the segues, deciding which song would sound best followed by another particular song. I would not change a thing about the song order on either disc. This fresh look at Taylor’s career that spans the years 1968 through 2007 reminds us that he is, like Paul Simon, a true American treasure. James Taylor’s music has not just helped to – in the words of the liner notes – “define a generation,” it helped a generation to grow, survive and prosper even when times seemed to be at their worst (“Sweet dreams and flying machines in pieces on the ground.”). Thank goodness we’ve been able to experience his artistry in our times. How sweet it was and still is. A review copy was provided by Sony Legacy Recordings.